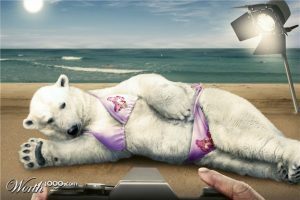 Our very own Marvin Bloom has taken to YouTube to share some of his feelings about the polar bear. Turns out he is not a big fan. He finds them to be scary and disgusting bullies. But in his short, funny video, he reveals something about the climate crisis that often gets overlooked. There is a specie that is threatened right now that we run into on a daily basis. It is warm and lovely and friendly, and it is under attack! I’ll let Marvin break it down for you. And if you want to hear more of Marvin and his off-beat approach to climate change, check out the Climate Stew radio show on iTunes, Stitcher, SoundCloud or right here at Climate Stew. We take global warming seriously, but we don’t try to scare the snot out of you.